I recently tried the new yarn from Spud & Chloë, called Stripey Fine, which is every bit as wonderful as the Fine, which is one of my favorites. The colors are fun and coordinate beautifully with the solids, which was the inspirational starting point for my new patterns. 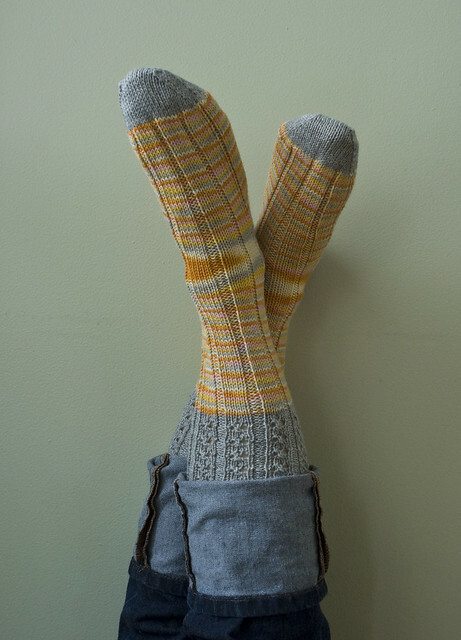 First off, a little sunshine for your feet: Goldberry’s Socks, named for the mysterious and lighthearted character Goldberry from The Lord Of The Rings, whose singing is like the sun shining out from grey clouds. Her presence is uplifting and comforting as these socks are in the middle of winter. With Clearwater Cowl, I was going for the comfy Saturday feeling, wearing your favorite jeans, whether hanging out or running errands. 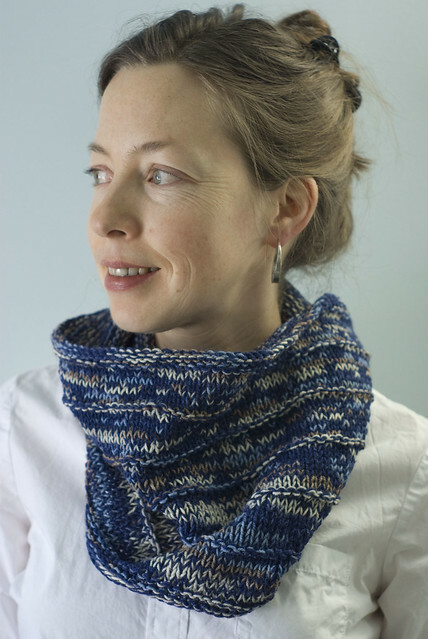 It’s also a perfect weekend project, as it knits up quickly, and you could easily finish it over a movie or two. Or, in my case, several episodes of our household favorite, Jeeves & Wooster.